I’ll be the first to admit, I’ve deviated from last week’s preliminary timeline for rolling out our latest product offering and subsequent advertising. If anyone at my new employer happens to be reading this and fears it’s indicative of my abilities as a Project Manager, be not alarmed. POTM isn’t an urgent priority at the moment (while getting up to speed in the new job most definitely is) and the slip was hardly unanticipated. It’s all about prioritization. I have made some gradual progress though. The staging site has the new product bundle (minus a good picture of a pregnant person – Dubs, I’ll be emailing you shortly to get that last piece taken care of). 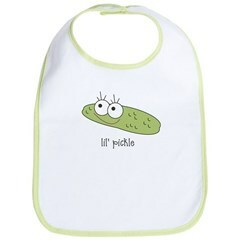 I also think I’ve identified the last component for the Proud Parent Blast – it’s a bib with a “lil pickle” on it. It’s cute, functional, and the right size for our packaging needs. My initial thought is to resell the one I found online, then create our own version if this proves to be a popular offering (and thus increase our margins). Is this great or what? Combine this with a Big Papa and Hot Mama pickle, and you have yourself baby gift nirvana that’s fun for the whole family.